..... Click the link for more information. at the rear of the plane. The stabilizer, or tail plane, is a fixed horizontal airfoil at the rear of the airplane used to suppress undesired pitching motions. To the rear of the stabilizer are usually hinged the elevators, movable auxiliary surfaces that are used to produce controlled pitching. The rudder, generally at the rear of the tail fin, is a movable auxiliary airfoil that gives the craft a yawing (turning about a vertical axis) movement in normal flight. The rear array of airfoils is called the empennage, or tail assembly. Some aircraft have additional flaps near the ailerons that can be lowered during takeoff and landing to augment lift at the cost of increased drag. On some airplanes hinged controls are replaced or assisted by spoilers, which are ridges that can be made to project from airfoils. The four basic parts of a jet engine are the compressor, turbine, combustion chamber, and propelling nozzles. ..... Click the link for more information. has become the main form of power in most commercial and military aircraft. The landing gear is the understructure that supports the weight of the craft when on the ground or on the water and that reduces the shock on landing. There are five common types—the wheel, float, boat, skid, and ski types. American airplane inventors and aviation pioneers. Orville Wright 1871–1948, was born in Dayton, Ohio, and Wilbur Wright, 1867–1912, near New Castle, Ind. ..... Click the link for more information. produced the first manned, power-driven, heavier-than-air flying machine near Kitty Hawk, N.C. The first flight lasted 12 sec, but later flights on the same day were a little longer; a safe landing was made after each attempt. The machine was a biplane (an airplane with two main supporting surfaces, or wings) with two propellers chain-driven by a gasoline motor. (VTOL), craft capable of rising and descending vertically from and to the ground, thus requiring no runway. While a balloon or an airship has obvious VTOL capability, both are very inefficient at moving parallel to the earth's surface. 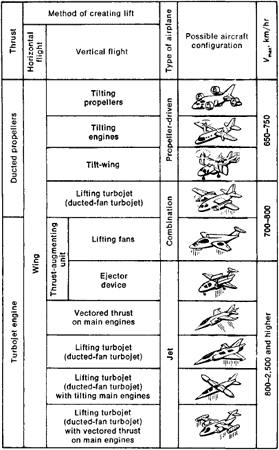 type of aircraft in which lift is obtained by means of one or more power-driven horizontal propellers called rotors. When the rotor of a helicopter turns it produces reaction torque which tends to make the craft spin also. (STOL), heavier-than-air craft, capable of rising from and descending to the ground with only a short length of runway, but incapable of doing so vertically. The precise definition of an STOL aircraft has not been universally agreed upon. ..... Click the link for more information. (STOL), seeks to design more conventional aircraft that have reduced runway requirements. The lessened lift associated with swept-back wing designs increases the length of runway needed for takeoffs and landings. To keep runway lengths within reasonable limits the variable-sweep, or swing, wing has been developed. A plane of this type can extend its wings for maximum lift in taking off and landing, and swing them back for travel at high speeds. place for landing and departure of aircraft, usually with facilities for housing and maintaining planes and for receiving and discharging passengers and cargo. 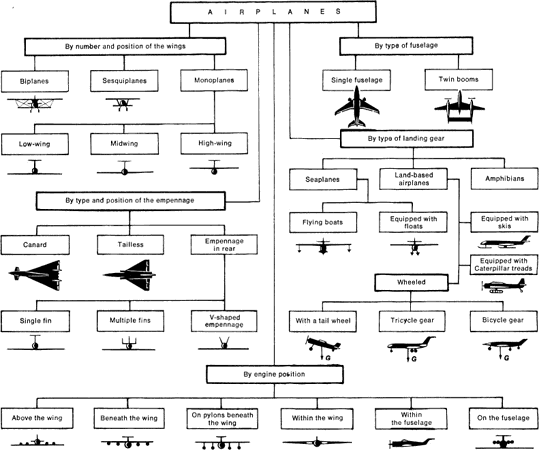 operation of heavier-than-air aircraft and related activities. Aviation can be conveniently divided into military aviation, air transport, and general aviation. , type of aircraft supported in the air by a horizontally mounted airfoil similar to that of a helicopter but unpowered. Invented by the Spaniard Juan de la Cierva, it was first flown successfully in Jan., 1923, in Spain. made between monoplanes—airplanes with a single wing—and biplanes—airplanes with two wings positioned one above the other. Biplanes with one wing shorter than the other are called sesquiplanes. Biplanes are more maneuverable than monoplanes, but they have greater drag, which reduces the flying speed. Most modern airplanes therefore use the monoplane design. Depending on the position of the wing with respect to the fuselage, airplanes are classified as low-wing, midwing, or high-wing. Depending on the position of the empennage, a distinction is made between airplanes of the classical design, where the empennage is located behind the wing, airplanes with a “canard” configuration, where the horizontal control surfaces are located in front of the wing, and “tailless” airplanes, where the control surfaces are incorporated into the wing. The classical design may feature a single fin, multiple fins, or a V-shaped empennage. Depending on the type of landing gear, airplanes are classified as land-based airplanes, seaplanes, or amphibians (seaplanes equipped with wheeled landing gear). Depending on the type of engines, airplanes are classified as piston-engine, turboprop, or turbojet airplanes. Depending on flying speed, airplanes are classified as subsonic (with a speed corresponding to a Mach number M < 1), supersonic (5 > M≥ 1), or hypersonic (M≥ 5). Aerodynamics. Aerodynamic force R arises as a result of the action of the air flow on the wing (see AERODYNAMIC FORCE AND MOMENT). The vertical component of this force with respect to the flow is called lift Y, and the horizontal component is called drag Q (seeAERODYNAMIC DRAG). The drag is the sum of the forces of air friction against the surface of the wing Qfr and the pressure of the air flow Qpre (which are combined in a quantity called the profile drag Qpro = Qfr + Qpre) together with the induced drag Qind, which arises when lift is present on the wing. Induced drag is caused by the formation of air vortices at the ends of the wing as a result of the flow of air from the region of positive pressure below the wing to the region of negative pressure above it. At a flying speed close to the speed of sound, wave drag Qw may arise. The lift of an airplane is usually equal to the lift of the wing, and the drag is equal to the sum of the resistances of the fuselage, empennage, and other parts of the airplane over which the airstream flows, together with the interference drag gint (the mutual influence of these parts). The lift-to-drag ratio K = Y/Q is an important characteristic of airplanes; the maximum value of the ratio for modern airplanes reaches 10–20. Engine installation. The power plant of an airplane consists of aircraft engines and various systems and devices, such as propellers, fire-fighting equipment, and the fuel, induction, starting, lubrication, and thrust control systems. In selecting the point of installation of engines and the number and type of engines, it is necessary to take into account the aerodynamic drag produced by the engines, the rotational moment that arises if one of the engines fails, the complexity of the layout of the air intakes, the possibility of servicing and replacing engines, the noise level in the passenger compartment, and other factors. Design. The basic parts of an airplane are the wing, fuselage, landing gear, and empennage. 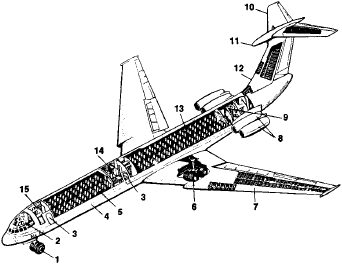 The general layout of an I1–62 turbojet passenger airplane is illustrated in Figure 2. The wing creates lift as the airplane moves. It is usually rigidly fixed to the fuselage but can sometimes be rotated with respect to the lateral axis of the airplane, as in vertical takeoff and landing aircraft, or its configuration (sweep and span) can change. Roll control surfaces (ailerons) and high-lift devices are mounted on the wing. The fuselage houses the crew, passengers, cargo, and equipment, and structurally connects the wing, empennage, and sometimes the landing gear and power plant. The landing gear is used for takeoff and landing and for taxiing on the airfield. Wheeled landing gear, floats (on seaplanes), skis, and caterpillar tracks (on airplanes with cross-country capabilities) may be installed on airplanes. The landing gear may be retractable in flight or fixed. An airplane with retractable landing gear has lower drag but is heavier and more complex in design. The empennage provides stability, control, and balance for the airplane. engines, trim tabs, landing gear, brakes, hatches, and doors. The airplane is controlled by means of a control column or stick, pedals, switches, and other devices located in the crew cabin. Automatic pilots and on-board computers may be included in the control system to facilitate piloting and increase flight safety; dual-type controls are used. The loads acting on the controls when control surfaces are operated are reduced by hydraulic, pneumatic, or electrical amplifiers called boosters and by servomechanisms. If the control surfaces prove ineffective, for example, during flight in very thin atmosphere or on vertical takeoff and landing aircraft, control is accomplished by means of gas vanes. The equipment of an airplane includes instrumentation, radio and electrical equipment, deicers, high-altitude and special-purpose equipment, and cabin furnishings. Additional equipment for military airplanes includes armament, such as cannon, rockets, and aerial bombs, and armor. Depending on the function, instrumentation is classified as flight-control and navigational equipment, including variometers, artificial horizons, compasses, and automatic pilots, equipment for monitoring engine operation, such as pressure and fuel consumption gauges, and auxiliary equipment, such as ammeters and voltmeters. The electrical equipment provides for the operation of instruments, control equipment, radios, the engine starting system, and lighting. The radio equipment includes radio communication, radio navigation, and radar equipment and automatic takeoff and landing systems. The high-altitude equipment, including air-conditioning and oxygen supply systems, is used to protect and ensure the safety of passengers and crew during flight at high altitudes. Cabin furnishings provide convenience and comfort for the passengers and crew. The special equipment includes systems that provide automatic monitoring of the operation of equipment and aircraft structures, aerial photography systems, and equipment for transporting the sick and wounded. Vertical takeoff and landing (VTOL) and short takeoff and landing (STOL) aircraft. An increase in the flying speeds of airplanes results in an increase in takeoff and landing speeds. Consequently, the lengths of runways can reach several kilometers. STOL and VTOL aircraft are being developed in connection with this trend. STOL aircraft feature high cruising speeds (600–800 km/hr) and a takeoff and landing distance no greater than 600–650 m. The reduction in takeoff and landing distance is achieved primarily by using powerful high-lift devices, by controlling the boundary layer, by using acceleration assists during takeoff and speed-reducing devices during landing, and by deflecting the thrust vector of the main engines. In VTOL aircraft, vertical takeoffs and landings are accomplished by using special lift engines, by deflecting the jet nozzles, or by rotating the main engines, which are generally turbojets. Typical configurations for VTOL aircraft are illustrated in Figure 3. Palenyi, E. G. Oborudovanie samoletov. Moscow, 1968. Kurochkin, F. P. Osnovy proektirovaniia samoletov s vertikal’nym vzletom i posadkoi. Moscow, 1970. Shul’zhenko, M. N. Konstruktsiia samoletov, 3rd ed. Moscow, 1971. Nikitin, G. A., and E. A. Bakanov. Osnovy aviatsii. Moscow, 1972. Proektirovanie samoletov, 2nd ed. Moscow, 1972. Sheinin, V. M., and V. I. Kozlovskii. Problemy proektirovaniia passazhirskikh samoletov. Moscow, 1972. Schmidt, H. A. F. Lexikon Luftfahrt. Berlin, 1971. Jane’s All the World’s Aircraft. London, 1909—. What does it mean when you dream about an airplane? Airplanes in dreams may carry the same connotations as air (e.g., ideas, intellect) or simply represent flying dreams. Particularly if one is the pilot, an airplane may represent one’s body, freedom, the power to “rise above” a situation, soaring to new heights, or even escape from everyday concerns. A heavier-than-air vehicle designed to use the pressures created by its motion through the air to lift and transport useful loads. A power-driven, heavier-than-air aircraft that derives its lift in flight chiefly from aerodynamic reactions on surfaces, which remain fixed under given conditions of flight. It excludes gliders and rotor planes but includes VTOLs (vertical takeoff and landing) and convertiplanes. We received an interesting amount of mail about dreams containing planes and plane crashes. It appears that people often dream about being in a plane crash, witnessing a crash, or being bombed or shot at from planes. Airplanes, like all other vehicles, symbolize a portion of your life’s journey. The part of your life that is represented is usually a memory, material from your unconscious mind, or something that is physically far away from you. Since we use planes to travel to places that are far away, the logical progression of this interpretation is that the airplane is symbolic of an event, individuals, or emotions that are either in the past, physically apart from you, or deep in the unconscious and far from conscious thought. Disturbing dreams in which you are being bombed or where you see a bloody crash scene may be trying to bring up issues and feelings that have been buried in the unconscious mind (from the past or the present) but are still powerful and disturbing to you. The more powerful, vivid, and disturbing this dream is, the greater the necessity to interpret and obtain a satisfactory meaning. The airplane touched down just past midfield, bounced and came to rest in the grass infield, inverted. With more airlines shifting to small and medium/large widebody airplanes like the 787 and 777X, the primary demand for very large airplanes going forward will be in the cargo market. Boeing airplanes provide airlines in the region with the capability to serve their expanding networks, the comfort and flexibility for a premium brand experience and the superior operating economics to create advantages not only for the airlines, but the flying public as well. Significantly, airlines in the Middle East currently have a backlog of 882 airplanes, 62 percent of which are long-haul, twin-aisle and large aircraft. This will give you a sanity check on the book numbers and may identify an airplane that has a market value higher or lower than what the book shows. The airplane was flown 79 times during a roughly three-year period. Passengers are the foundation of air travel, and in a competitive market the airlines will continue meeting passengers' demands for more direct nonstop flights to destinations around the world with longer-range, efficient and comfortable airplanes," says Randy Baseler, Boeing's commercial airplanes vice president, marketing. The A-10 or the other aircraft that have bombs on them can do something about those forces that they find, they're in close proximity, within five miles, even closer in many cases, but there's no way for that Predator UAV to communicate this to that airplane in the sky because the Predator is in the intelligence channels and the airplane's in the operational channels. SOFTWARE AS PROTOTYPES Back about 40 years ago, according to Richard Smith, director of CAD/CAM products and services for The Boeing Commercial Airplanes, whatever software Boeing had for aircraft design and simulation was all internally developed. First, when there are no private charter companies in the vicinity, X would have to pay for the flight to bring the plane to him, and then for the return on the airplane to the home city. Although the firm had more than a 70% share in the global commercial airplane market, the increased pressure from airlines to reduce costs made this revenue figure unacceptable to the firm's management and shareholders. What will make an airplane of the future more usable by average people is the revolution in digital bandwidth, satellite navigation, and datalink wireless communications," insists NASA's Bruce J.